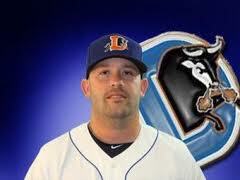 Watching Durham Bulls Baseball: Jesus the Hero! Jesus Feliciano, one of nine left-handed hitters in the game, got to be a hero, twice. The first time was in the 8th inning when he hit a double that scored Sean O’Malley and Kyle Hudson putting the Bulls ahead 4-3. But the Indians got a run back in the 9th and the 4-4 tie went into the 10th. One more time Feliciano came to bat, with O’Malley again on base (this time on third), and a single was enough to win the game. Meanwhile Lance Pendleton got his first start since joining the Bulls and Montoyo got to play matchups with the rest of the bullpen. Nunez, Gaub, Leuke, and Ramos all did just fine, even if Ramos did give up a home run to force Feliciano’s heroics. Speaking of home runs, the last home run hit by a Bull was Will Rhymes’ against the Norfolk Tides six games ago (the Bulls have only hit 7 home runs this year, the fewest in the league). Speaking of Will Rhymes, he got called to Tampa Bay yesterday afternoon. That left the Bulls with exactly one position player on the bench, catcher Craig Albernaz, who besides being the only right-handed batter on the team, was busy warming up pitchers all night. That left Charlie Montoyo the job of making sure his guys were nice to the umps, otherwise he’d probably have to use a pitcher as the DH. That was a difficult task when the ump made a particularly bad call invoking a fairly obscure rule. The ump was flashy about it though. You could just see him back in ump school when he learned the rule and thinking, someday I’m going to be able to call this and somebody’s going to argue with me and I’ll get to throw him out of the game. The Bulls had the bases loaded and no outs in the 4th inning. Kyle Hudson hit a grounder to second. The first part of a fairly routine double-play effort was started, but a nice, hard slide by Sean O’Malley into second broke it up. Should have been one out and a run scored, but no. The ump dances into the play, calls interference and deems both O’Malley and Hudson are out, plus the runners have to come back to second and third, and there's two outs. I guess that’s the rule, but I think the ump was just showing off. The News & Observer noticed that the Bulls exist with a page one story. Unfortunately it was about Tim Beckham. Even with the arrival of Cole Figueroa from Montgomery, the Bulls will still have a vacant spot on the roster. Sure wish Guyer would get well soon. Figueroa is, of course, a left-handed bat. Bulls games are also being broadcast on HD radio. I’m going to have to look into that. You will see at the link the AM 620 coverage. No wonder I can barely get the games at home! This is an update of the runs scored-runs allowed chart. As of last night’s game, the Bulls have scored 88 runs and allowed 146 runs. The chart shows the game-by-game path to that condition. If you run these numbers through the Pythagorean Expectation formula, it will tell you that the Bulls "should" be at 7-19 rather than the 8-18 they are. In general, differences between expectation and actual is attributed to relief pitching and luck. I’ll take the pitching. Just to show new Bulls fans what we old farts are so upset about this year, this chart shows how things were going at this point in previous years. It ain’t pretty. But it’s getting better. It’s getting better. It’s getting better. We hope. We hope. We hope. If you can tolerate the Bulls iPhone or Android app, the game audio is there under "Listen Live". I say tolerate as the audio on the iPhone app in particular tends to vanish and not return - I've seen this on several different WiFi networks as well as cellular - and it won't run in the background - you have to stay on that page of the app for it to keep playing, and make sure your phone doesn't go to sleep. The Android app used to be the opposite, you'd start the audio playing and there was no way to stop it, short of powering the phone off. The other option is the MiLB.TV streaming video package, though that's only on PC not mobile. Unfortunately today's matinee has an "Audio Unavailable" tag and no graphics whatsoever, making the action almost impossible to follow. When the iPhone app audio was working (it just crapped out after 2 minutes) it was trailing the MiLB video by about a minute. Finally ended up watching video + game track. If you've got a PC, you can stream 620 from their website. That ump call was ridiculous last night. O'Malley slid at the shortstop for sure, but that's what you do on that play. It's probably technically against the rules, but it's a play that happens once a game at least. I usually do a "how to listen to/watch the Bulls" each year. Guess it's about time to do that, but I wanted to at least test the HD radio first. And I wanted to wait until they got the TV going on Time Warner. I think that's happening now. Lastly, I was going to ask for some help regarding MiLB-TV, because I thought it was a waste of money last year. Too many stadiums have really crappy TV streaming. I will add these, and any other observations you may have before I put up the post. For myself, I watch gameday and listen via the links at the International League scoreboard site (same feed as 620, Kinas) when Bulls are on the road. The iPhone app drains the battery on my iPhone too quickly for it to be of any use, and too intermittent while I'm driving.